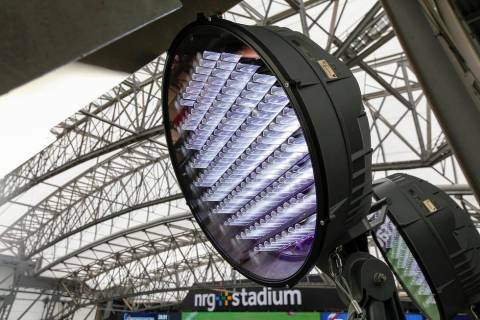 Today, NRG StadiumTM, home of the Houston Texans and the Houston Livestock Show and RodeoTM, has become one of the first professional football stadiums in the United States to illuminate its field with an array of high-efficiency LED lights. The new lights, part of NRG Park’s sustainability master plan spearheaded by NRG Energy, will use 60 percent less energy than the lighting array it replaces. For a state-of-the-art lighting solution, NRG and stadium officials sought the expertise of sport lighting experts Musco Lighting, which engineered an innovative custom lighting system. The new high-efficiency system draws 337 kW at full power, 60 percent less than the stadium’s previous light system. The field lighting array is comprised of more than 65,000 light emitting diodes (LEDs), which are mounted in 480 optically enhanced luminaries. Dimming and instant on/off features further contribute to efficiency capabilities, particularly for concerts and RODEOHOUSTON(R) events where full light levels aren’t necessary. The new LED lights are part of a sustainability master plan for NRG ParkTM. NRG has also installed an eVgo(R) electric vehicle parking lot at its namesake stadium that includes six charging stations, and soon, with the installation of more than 700 solar panels, NRG Stadium will become the first professional football stadium in Texas to draw power from the sun. With these updates, NRG Stadium joins the growing ranks of other professional football venues NRG has worked with to embrace smart energy solutions that draw power from sources such as the sun and wind, including FedEx Field(R) in Maryland, Lincoln Financial Field(R) in Philadelphia, MetLife Stadium(R) in New Jersey, Patriot Place(R) in Massachusetts and Levi’s(R) Stadium in California. NRG is leading a customer-driven change in the U.S. energy industry by delivering cleaner and smarter energy choices, while building on the strength of the nation’s largest and most diverse competitive power portfolio. A Fortune 250 company, we create value through reliable and efficient conventional generation while driving innovation in solar and renewable power, electric vehicle ecosystems, carbon capture technology and customer-centric energy solutions. Our retail electricity providers serve almost 3 million residential and commercial customers throughout the country. More information is available at www.nrg.com. Connect with NRG Energy on Facebook and follow us on Twitter @nrgenergy. NRG Park is the premier sports, convention, tradeshow/consumer show and entertainment complex located in Harris County, specifically Houston’s South Main corridor district. Three major facilities-NRG Stadium, NRG CenterTM and NRG ArenaTM-encompass 350 acres and provide 26,000 parking spaces. NRG Park is home to the NFL’s Houston Texans, the Houston Livestock Show and Rodeo, Super Bowl(R) XXXVIII & LI, WrestleMania(R) X-Seven & 25th Anniversary of WrestleMania(R), NCAA(R) Division I Men’s Basketball Championship South Regional 2008, 2010 & 2015, NCAA(R) Division I Men’s Basketball Final Four(R) 2011 & 2016 and hosts over 500 events annually. For more information visit nrgpark.com. Get social with NRG Park on Facebook and Twitter @nrgparkfan and on Instagram @nrgpark.